I ran a 10K with a gym client last Monday. 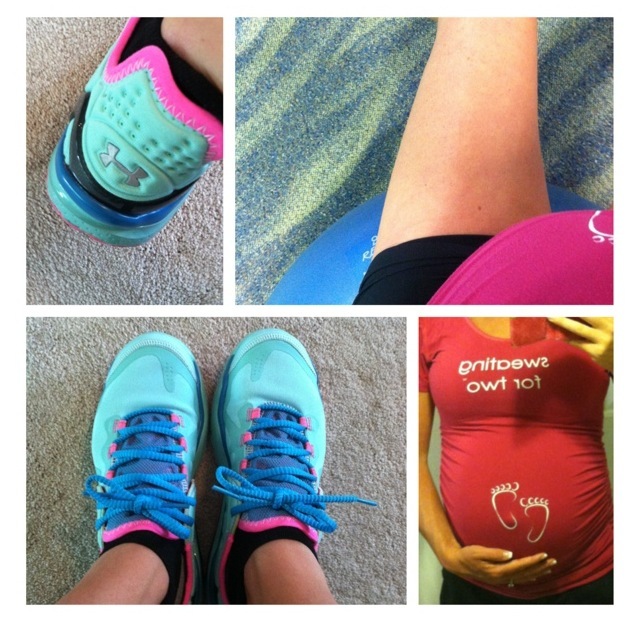 Women often ask me if it’s “safe” to exercise in the ninth month of pregnancy, and if so, what workouts I am personally maintaining in the final weeks of the third trimester. 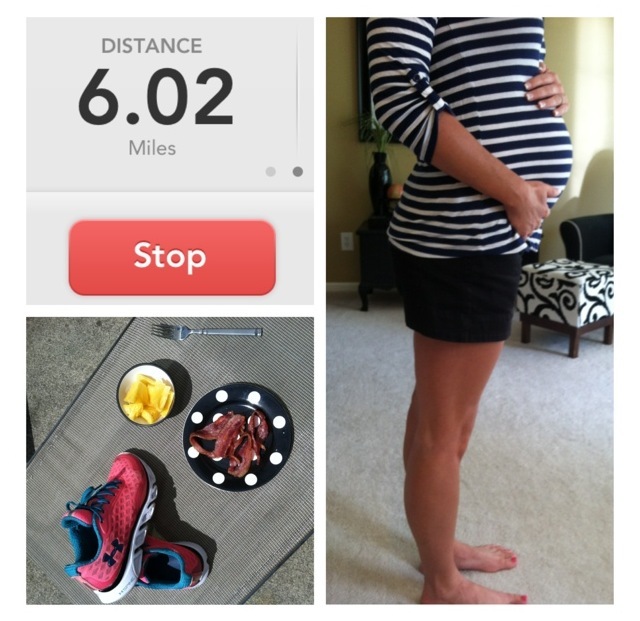 Of course, it is both safe and important to continue exercising in the ninth month of pregnancy. This pregnancy, I have actually been able to maintain an even more intense workout schedule than I did with my first pregnancy. In part, because I am carrying Baby Boy differently, and in part, because I was more educated and prepared to strengthen important muscle groups this pregnancy to keep me going strong right up until the end. In my first pregnancy, I had some soreness in my back and pelvis toward the end and had to scale back my workouts quite a bit. This time around, I was sure to do a lot of back and core strengthening exercises to prevent injury or strains in the ninth month of pregnancy when my belly is at its largest. Be sure to check out my Fit Pregnancy Total Body Workout DVD for ideas on how to strengthen important muscle groups during all three trimester of pregnancy. I have been doing more ab workouts on the exercise ball. 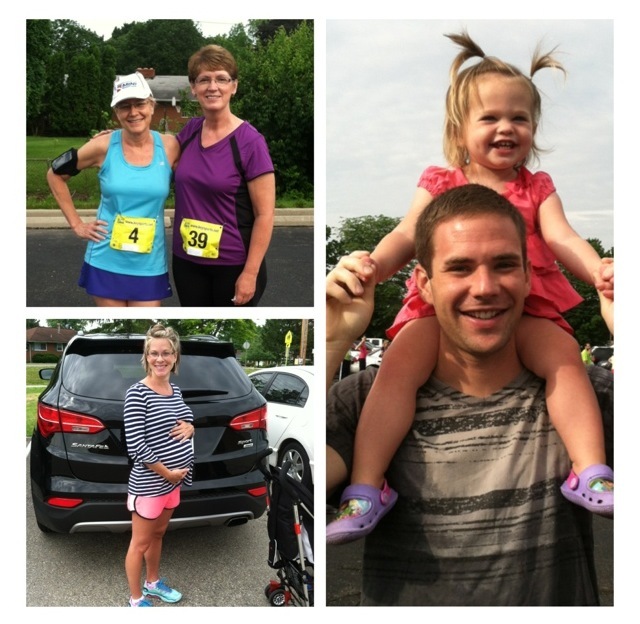 I ran/walked 4.5 miles while supporting a gym client at a race. Emma had so much fun watching! As you can see, I am still able to maintain a fairly rigorous workout schedule, even in the ninth month of pregnancy. However, I have definitely needed to scale back my intensity and speed during my runs and cardio work. I am still doing a good bit of weight training, but I have modified my ab exercises to do more on the exercise ball versus floor exercises. I am really hoping that Baby Boy decides to make an entrance into the world this week. I have constant Braxton Hicks contractions, and I’m soooo ready to meet him. I got the green light from my doctor to deliver as early as yesterday, but after about 6 hours of regular contractions, they simply died down. I delivered Emma at exactly 37 weeks. Did you deliver your second later than your first, or vice versa?